With just a little time left to bird in the upper peninsula we had a few key birds that we still had not seen. Luckily we knew we were heading into better areas for Boreal Chickadee and Spruce Grouse. After waking up early we headed west to Peshekee Grade. While driving the road to the parking area for McCormick Tract we were able to see a few good birds including Pine and Evening Grosbeak, Pileated Woodpecker, and Ruffed Grouse. Cindy, one of the birders with us, spotted one of the Ruffed Grouse across the creek in a tree. After getting out of our cars, everyone was able to get great scope views of the grouse. 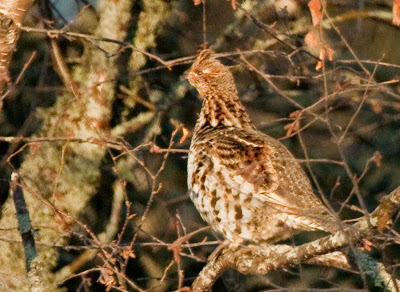 One of the Ruffed Grouse. After arriving at the parking area for McCormick Tract it was quickly apparent that there were lots of birds around. Within a couple minutes I heard a Boreal Chickadee and got a quick view of it. A few minutes later two of the others in our group got scope views of the bird. Right after I heard the first Boreal Chickadee, a flock of Common Redpolls flew in and landed at the top of roadside tree. For some reason redpolls have been scarce in the UP this winter so this small flock was exciting to see. I had told a few people in our group who had never seen redpolls that we didn't have much chance so this flock excited them more than anybody. While planning our next move after our hike we were able to hear some Red Crossbills fly over. When we were getting ready to go, Alison, a birder from Michigan, told us they had just seen a small flock of Boreal Chickadees just up the trail. She took us back up to the spot and everybody in the group was able to see them well. After our successful Boreal Chickadee stop we went to lunch at a small restaurant called Mt. Shasta. One of the really cool things about the UP is that at almost every restaurant there are feeders either out back or hanging around the outside. After lunch we headed to a camp where Ted, one of the birders in our group, had worked as a kid. One of Ted's friends who lives in the UP and who had birded with us all day, was able to show us around the camp. We then drove into Marquette, the largest city in the UP, to look for gulls. 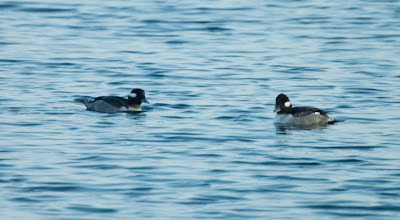 There were no gulls present but we were able to see a few species of waterfowl including Long-tailed Duck and our only Canada Geese of the trip. While at dinner we got a report of Spruce Grouse about an hour away so we made the decision to stop by the spot on our way home the next day. 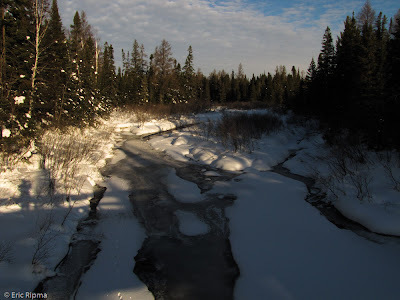 The spot for the Spruce Grouse is called Baraga Plains. We arrived before it was completely light but within a couple miles flushed a female Spruce Grouse from along the road. We were never able to refind her unfortunately. I also heard a few Spruce Grouse just up the road from this spot but we were not able to find them either. Fortunately we did get scope views of a flock of Red Crossbills which made up for the lack of a great look at the grouse. A Lesson Learned: Don't run in snow that is more than a foot deep because you will probably end up on your face.